Aongus and I stopped by the public library in Bethnal Green over the weekend since I wanted to show him its glorious architecture. It’s in the park we traverse en route to the Central Line Tube Station. The woodwork and the natural lighting in the reading rooms are superb. And since Aongus selected a new thriller from the shelf, it freed the copy of “Brooklyn” he was carrying along in his bag. I dug it out of his bag on the Tube and read much of it in the course of over our weekend adventures. Granted, I normally read non-fiction since it’s much less addictive. Once I get started with a novel, I can’t put it down. As such, I’m nearly finished reading the novel now. It is, as you probably recall from the contemporary motion picture by the same name, about a young Irish woman who boldly moves, alone, across the Atlantic to start a new life. I empathize with her experiences and I recognize many of the places she describes–both in Brooklyn and around Enniscorthy town and county Wexford, her original home. I’ve enjoyed both the book and the feature film but have learned more about Ireland form the book. Aongus borrowed the paperback of “Brooklyn” from the Idea Store in Whitechapel–a modern edifice but also lovely. It was designed by architect Sir David Adjaye, who we learned much more about later in the weekend while visiting the Desing Museum. More on his exhibition in a future blog! In any case, Aongus and I are very lucky to live near great libraries here in London! Primary sources provide first-hand testimony or direct evidence concerning a topic under investigation. They are created by witnesses or recorders who experienced the events or conditions being documented. Often these sources are created at the time when the events or conditions are occurring, but primary sources can also include autobiographies, memoirs, and oral histories recorded later. Primary sources are characterized by their content, regardless of whether they are available in original format, in microfilm/microfiche, in digital format, or in published format. For historians, primary documents include photographs, letters, news clippings and the like. For philosophers, I’d say they could include original texts where an idea first appeared in written form. As a social science researcher, I myself am collecting audio-taped testimonies of female students who have first-hand experience of first-year engineering education. All three of these examples–philosophy, history, and social science research–involve high levels of interpretation of documents, ideas, and stories contributed by others. Whereas my historian friend, Cecilia Hartsell, is investigating phenomena that include both the 1916 Uprising as well as the return of soldiers from WWI, my colleagues in philosophy spent a recent weekend discussing the phenomena of intentionality and normativity. These historians and philosophers seek to understand the context of events and ideas arising in the past, and what the authors of various documents meant at the time they spoke, or wrote. I joined a group of philosophers for a February 19-20, 2016 seminar that explored various aspects of phenomenology. The event was hosted by the School of Philosophy at the University College of Dublin but held at Newman House, on Saint Stephen’s Green in Dublin. Attending the seminar, I learned much more about phenomenology. I also learned more about the way philosophers think, study, generate new knowledge and new understandings, communicate with each other, test ideas, and seek to uncover the complex meanings embedded in writings by philosophers throughout the ages. I am indebted to Prof. Dermot Moran and Dr. Elisa Magrì for inviting the public to their event so that I could attend, and to DIT’s new PhD student, Diana Adela Martin, for notifying me about the event. Much of the discussion focused on phenomenology, which is both a philosophy and a social science research methodology. 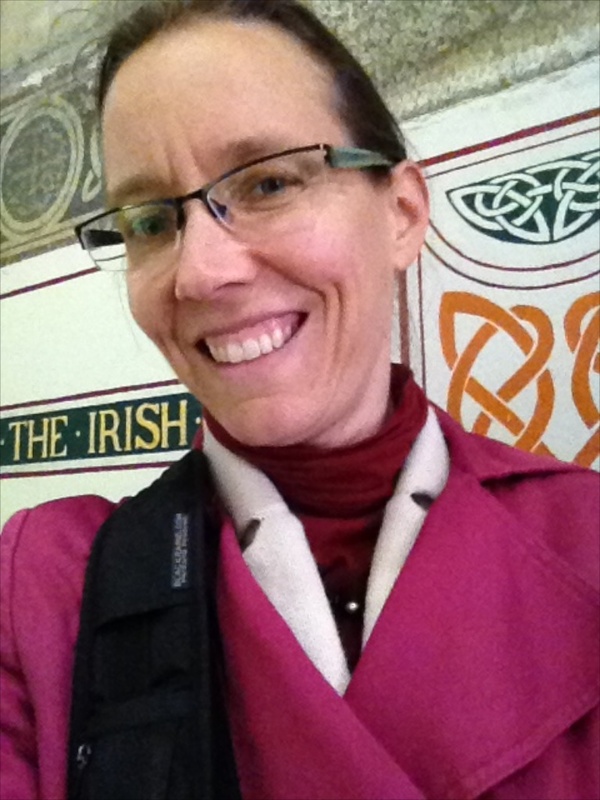 I’m currently using the methodology to study women’s experiences of STEM education, and will submit later this week a manuscript on another phenomenological research study of teachers’ experiences working together to implement Problem-Based Learning at Dublin Institute of Technology. Related to experience, I must admit that visiting Newman House was an exquisite one. In this house, John Henry Newman founded University College Dublin (originally called the Catholic University of Ireland). I believe that he later became a cardinal and was beatified by the Catholic Church, despite the fact that his views did not always match the official sanctioned interpretations of the Church. Today, one can visit Newman Houses on campuses world wide, like the one I attended while a student at Virginia Tech. I’ve attached photos of the formal entry hall at UCD’s Newman House, for your enjoyment. I got so caught up in discussions at each coffee break that I never made it all the way to the lovely formal garden behind the house. Maybe next time! Hanging out with Daniel O’Connell. My photography exhibition was held in the house where he used to live, on Merrion Square. Our Fulbright shin dig included a visit to Glasnevin Cemetery. I’d spent about an hour here, just outside the gate, one evening near Halloween when Esther was visiting. That was part of the (very worthwhile and historically accurate) Ghost bus tour and we followed it up with a visit to John Kavanagh’s “Gravediggers” pub. The cemetery itself was started outside the city, at the same time the same thing was happening all over the USA. The American cemetery movement actually sparked the American park movement, believe it or not. The historian J. B. Jackson explains that people found they loved going to the suburban cemeteries — which were new and had wide open (corpse-free) spaces. These early cemeteries were well-designed and had beautiful architectural features, as you can see on the home page for Thornrose Cemetery where my grandparents lay today. In any case, in the ten year period of the Civil War, nearly every American city built a “central” park, and Frederick Law Olmstead’s office designed many of them… and many college campuses too. Glasnevin Cemetery (Irish: Reilig Ghlas Naíon), officially known as Prospect Cemetery, is the largest non-denominational cemetery in Ireland with an estimated 1.5 million burials. It first opened in 1832, and is located in Glasnevin, Dublin. The stories I heard on our tour of the cemetery brought to life for me the history of Michael Collins and Daniel O’Connell, two of Ireland’s most important political figures. Éamon de Valera and Countess Markievicz are also buried here. …at the famous Glasnevin Cemetery. …each and every day of the year. ..his monument was bombed by Loyalists. And today there is still no stair to the top. ..and the history of this place. In times of disease, they sealed coffins like these carefully to keep illness from spreading. Countess Markevicz, the first elected female minister, is buried here. …and learned how they’d bought remains of a famous person from the UK here, to convince people to use this cemetery. This is the plaque that Fergus Whelan posted on the stair tower at the Church on Mary Street (a religious building now operated as a bar and restaurant). 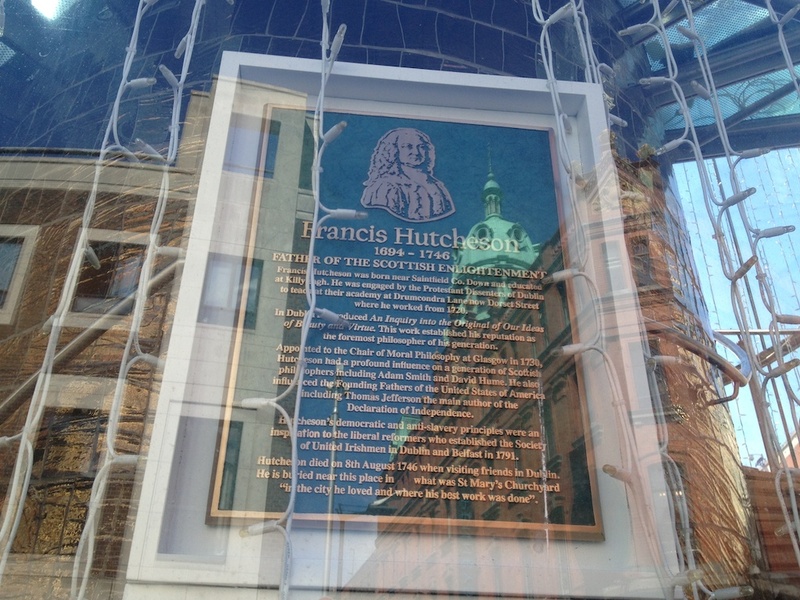 The plaque honors Francis Hutcheson, “Father of the Scottish Enlightenment,” whose ideas made their way into the US Declaration of Independence. The plaque’s coverings catch refections of the buildings across the intersection, at the west end of Henry Street. Here you see Primark’s world headquarters (the lovely red brick building with the patina-ed copper dome) to the right of Francis’ likeness. Fergus Wheelan is a walking archive of Irish history and politics. He’s a self-made historian who brings complex history to life and makes it simple to understand. Every guest who visits I find reading his book, Dissent into Treason. It’s available from Amazon in the US. I can’t fathom the amount of time he spent in libraries and archives research this book — nor the time it took to understand, structure, and explain the information in such an enlightening way. It’s no wonder Fergus drawn to the Cobblestone Pub, a place operated by Tom Mulligan (a man with a degree in Irish history and policies himself). Every visit to the Cobblestone is a lesson in tradition for me. Last week, I had more friends in tow. Here you see Toni Grey (an English friend who retired to Tunisia many moons ago) and her Italian boyfriend, Toni and Giuseppe Conte. Incidentally, Giuseppe rents apartments and B&B rooms in Rome. I visited one of the apartments and found it to be quite charming and extremely well located (near Campo de’ Fiori). You can contact Giuseppe at <g.conte@promedinternational.com> for more information. Headed to the Cobblestone with Toni and Giuseppe. My English/Tunisian and Italian friends at the Cobblestone Pub. We were too far from the musicians’ corner to hear what was going on, so I asked Fergus to come sing us some tunes. And, of course, he told some stories. And we learned more about the history of Irish religion and politics. Image of Cobh downloaded from the Visit Cobh website. Recently, I’ve uncovered more and more roots to my family tree in Ireland. For me, it starts with my great grandmother, Teresa Neenan. She was a smart, spry, and energetic woman who was a dear part of my early life. We called her “Nanny” and spent a number of holidays with her. I vividly recall images from an Easter she spent in Staunton, Virginia (my parents’ home town). My great grandmother was born in Astee and christened in Ballybunnion (in Co. Kerry) in 1890. She left Cobh (in Co. Cork) in 1912. Like so many others, my great grandmother left Ireland when times were very hard, and opportunities limited. In the States, Teresa married “Beppie” O’Mara who owned a taxicab company in Millburn, New Jersey. They had four girls, including my grandmother Alice who was born in 1916. That was a pivotal year in history when Ireland began its final quest for independence…. I visited Cobh recently and saw the breathtaking neo-Gothic cathedral that marks the summit of the town. I have enjoyed my visits to Cobh immensely. It’s amazing to realize that this Fulbright scholarship brought me back to Nanny’s homeland. It’s a land that has become my spiritual home. The welcome I have received here has been inspiring and heartwarming. I hope Nanny would be proud. My mom and I look forward to visiting our “cousins” in Kerry in May. We’ll get to retrace more of our roots then and meet even more family! Fergus Whelan, Jerry Crilly, Tom Mulligan, and Shannon Chance at the Cobblestone last night. Kevin Donleavy had written me to inquire about the plaque I mentioned in the blog post “Peace in Ireland.” Last night I had the chance to learn a little more. I was at the Cobblestone to meet Jerry regarding a little Christmas project we’ve got in the works. And Fergus Whelan, the organizer of the December 1 event, happened to be there too. The plaque, Fergus explained, was to honor Francis Hutchinson who was born in Northern Ireland but died in Dublin. No grave marker had ever been installed. Fergus has righted this oversight. A plaque now shines near the church on Mary Street in Dublin. This group unveiled it on December 1, 2012 — the day I met them in the Cobblestone. The December 1 events commemorated that remarkable man, Francis Hutchinson, who, among other things, influenced the American Declaration of Independence. He did so via his friend Thomas Jefferson. The plaque is well worth a read! As explained the group shot are formers prisoners from both sides i.e. loyalist and republican. They came to Dublin to be present for the unveiling of the plaque. Fergus asked these folks to travel down to Dublin together, on one bus, and to attend events together celebrating the life of Francis Hutchinson. They put aside decades of ill will and united for this cause… because Fergus asked them to come. I know this story will matter to Kevin Donleavy. He has a similar project underway (that I’ll tell you about in due time). What amazing experiences — sharing evenings with people who have such divergent points of view and yet finding unity within them. I’m thankful for Fulbright and thankful for my friends at the Cobblestone pub. Jerry learning to use ” ” in conversation last night. He still needs some work! Meeting musician and Irish track star Linda Maye.